FOXBORO, Mass. – Despite losing only two games all season and claiming the top seed in Div. 2 South for the second year in a row, Foxboro has been guilty of getting off to slow starts. In the playoffs, allowing a team to hang around is dangerous, as the Warriors were reminded in a hard-fought, two-point win against No. 16 seed Notre Dame Academy in the first round. The warning was heeded by the Warriors, who came firing out of the gates in Saturday night’s quarterfinal against Dighton-Rehoboth. 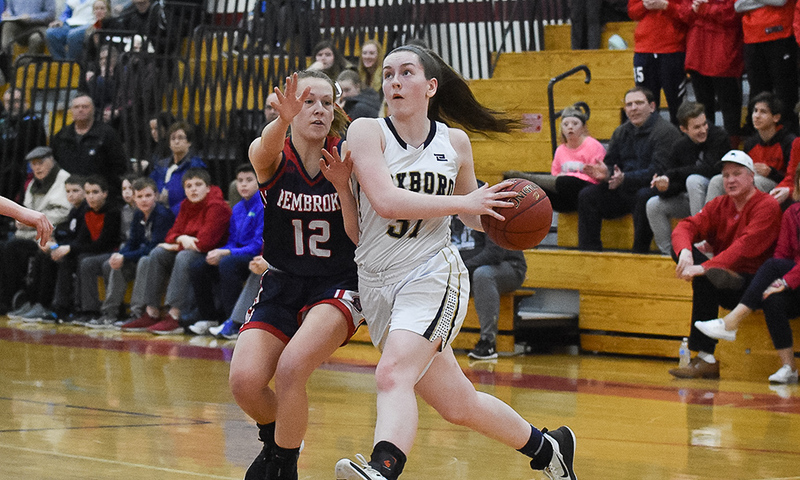 Foxboro (20-2) jumped out to a 21-2 lead in the first quarter and never looked back, rolling to a 66-35 victory to reach its third straight sectional semifinal. Although she knocked down five three-pointers in the first round against NDA, sophomore Katelyn Mollica didn’t have a great shooting night overall. That was not a problem on Saturday. She drilled three from beyond the arc in the first quarter and knocked down a jumper off a feed by Lizzy Davis. Chelsea Gibbons also came out on fire, hitting a pair of threes of her own and scoring all 10 of her points in the first. The Falcons barely had time to register what was happening before the Warriors finished a 19-0 run that put the hosts ahead 21-2. D-R cut into the lead a little before the end of the quarter but Foxboro was in complete control up 16. It was unlikely that the Warriors would be able to continue the hot shooting start, but their pressure defense made it difficult for D-R to get a run started and Foxboro’s ability to crash the boards kept giving them second and third chances. Abby Hassman and Yara Fawaz each finished with nine rebounds apiece and combined for 10 in the first half alone. Shakirah Ketant added seven boards off the bench. Foxboro led 33-17 at halftime and came out of the break looking to put the game away. Davis (14 points) drilled one of her four three-pointers to get things started and assisted on a Hassman bucket. Mollica then scored the next five, drilling a three and hitting a floater at the shot clock buzzer. Fawaz (seven points) had a steal and a layup and Ketant turned an offensive rebound into another basket. Foxboro then got four looks at the basket and finally Ketant smartly tipped a rebound to an open Mollica, who buried the baseline jumper. The Warriors led 49-26 after three. There was no way back for the Falcons in the fourth, as Mollica scored five more, including her fifth triple of the night, and Davis added eight points, including two more from beyond the arc. It was a dominating victory for the two-time defending South champions and sends them to the sectional semifinal on Wednesday night at Bridgewater-Raynham. The Warriors will face the winner of Pembroke and Norwood, which was moved to Sunday afternoon. FOXBORO, Mass. 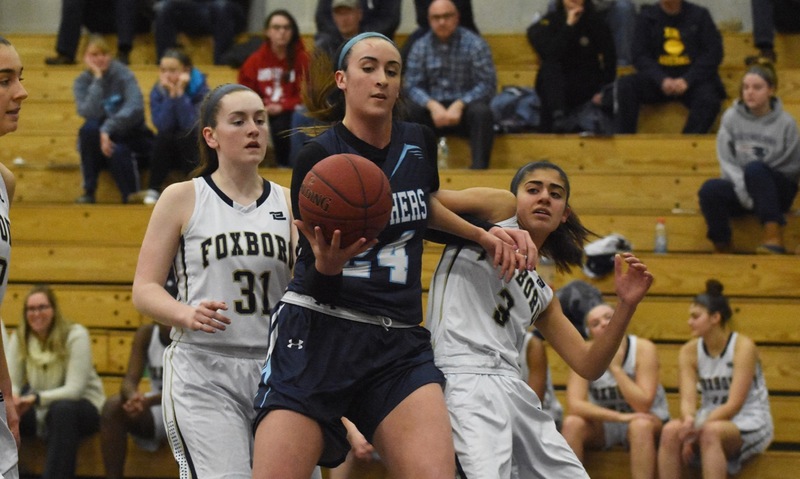 – Coming into Tuesday night’s showdown, Foxboro and Franklin were both unbeaten (8-0) in Hockomock play and were the league’s top two scoring teams, its top two defensive teams, its two division leaders, and boasted the league’s top two scorers. It was clearly a battle of the top two teams in the Hock and it was a battle that was dominated by the Hock’s top scorer, Ali Brigham. The 6-foot-3 junior center scored 27 points, pulled down 15 rebounds, and blocked six shots, controlling the paint on both ends of the court to help Franklin remain unbeaten with a 52-40 victory. Franklin’s win ended Foxboro’s 26-game win streak and 33-game league win streak. 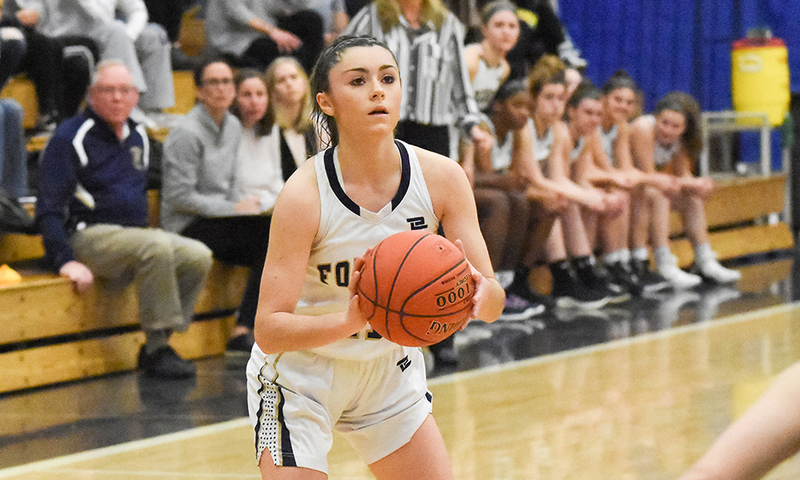 While Brigham rightfully stole the headlines for her all-around game, Franklin also won because of its defensive performance on Foxboro sophomore Katelyn Mollica. The league’s second leading scorer was held to just nine points (four in the fourth quarter) thanks to the very close attention of sophomore Erin Quaile. With Mollica contained, Foxboro was held more than 20 points below its season average. The Panthers jumped out to an early lead, as Brigham scored eight points in the first, matching Foxboro’s total in the quarter. She twice got baskets on offensive rebounds, drove to the basket and was set up by a Bea Bondhus drive. Bondhus (nine points) also scored twice herself and Megan O’Connell (10 points) added four points. Chelsea Gibbons hit a three, Mollica hit a pull-up three and Lizzy Davis scored on a jumper, but that was all the Warriors could manage against Franklin’s pressure defense. That pattern held in the second, as the Warriors were held to eight points as a team again. A quick 6-0 run extended the Panthers’ advantage to 14 points, but Foxboro hung around thanks to four points from Yara Fawaz (team-high 12 points and six rebounds). But, whenever Foxboro seemed to be climbing back into the game, Franklin responded and Brigham scored off assists by Quaile and Elizabeth Wilson to push the lead back to 12 at halftime. The third quarter was back-and-forth. Brigham was again the focal point for the Panthers, who found different ways to get her the ball on the block and moved the ball well from side-to-side and kept the Foxboro defense moving. With Brigham and O’Connell (seven rebounds) controlling the glass, Franklin also prevented the Warriors from getting out in transition. 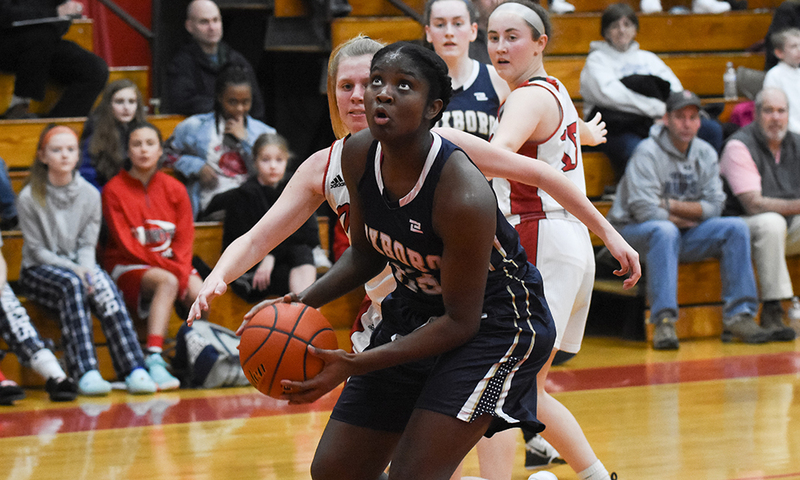 Fawaz scored four more points in the third, combining well with fellow forward Abby Hassman (five assists) to try and step away from the basket and, of course, Brigham. Davis also drilled a three and Anita Busznyak took a lead pass from Mollica for a rare basket on the break. Despite Foxboro feeling like it was on the brink of a comeback, the Warriors fell a further point behind heading to the fourth quarter. Still, the hosts kept battling back, with six straight points to start the fourth cutting the lead to 43-36 after Mollica’s steal and layup. O’Connell answered with a basket and then assisted on a Brigham basket. Fawaz got into the lane to score and make it a nine-point game again, but Bondhus came right back down and drilled a three from the left wing to push the lead into double digits and seal the win. Franklin (11-1, 9-0) will be back home on Friday night to host Attleboro, while Foxboro (10-1, 8-1) will host North Attleboro, which comes in with five wins in its last six games. Attleboro, 60 @ Foxboro, 32 – Final – Click here for a photo gallery from this game. – Attleboro junior Lorenzo Wilson came off the bench to score a career-high 15 points, including seven straight in the second quarter that ballooned a 6-0 run into a 13-2 spurt that gave the Bombardiers first half separation. “He’s been working very hard in practice, you can see where our strength is we want to go inside out, and we didn’t skip a beat with him in there,” said Attleboro head coach Mark Houle. “He’s been finishing stronger too, it was great to see him have a good game today.” Attleboro led 11-10 late in the first but finished with a 6-0 burst, and then opened the second behind Wilson with a 7-2 run to make it 24-12. Attleboro led 30-14 at half and 45-25 heading into the final quarter. Junior Qualeem Charles added 14 points and six boards and Mason Houle had 10 points, five rebounds, and five assists for the Bombardiers. Foxboro sophomore Kevin Gallagher had a team-high 12 points. Foxboro, 64 @ Attleboro, 36 – Final – Katelyn Mollica led the unbeaten Warriors to a big road win, scoring a game-high 19 points. Abby Hassman added 13 and Lizzy Davis had 12 for Foxboro. Foxboro, 5 vs. Norton, 2 – Final – Click here for a Photo Gallery from this game. Jack Watts scored a pair of goals to lead Foxboro to a season sweep of the Lancers. Foxboro opened the scoring in the first period when Kirk Leach took and outlet pass from Brendan Tully and beat the Norton goalie over the glove side. The Warriors added three goals in the second period to take control of the game. Watts and Ronnie MacLellan each scored on rebounds, after saves by Norton goalie Mitchell Doctor (of Sharon) and then Brady Daly scored on a quick transition that caught the Norton defense pinching up the boards in the offensive zone. Norton cut the lead in half with two goals within 19 seconds of each other late in the third period, the second by Sharon’s Jared Flueckiger, but Watts scored on a two-man advantage (assisted by Leach and MacLellan) to seal the points. FOXBORO, Mass. – With Foxboro girls basketball trailing, 30-25, with just under two minutes left in the second quarter against Oliver Ames, the Warriors were in need of a spark to close the deficit before halftime. A three-pointer by sophomore Katelyn Mollica (18 points) cut the lead to 30-28 before Anita Busznyak tied it up with a layup. With time winding down, Chelsea Gibbons hit a layup just before time expired, and Foxboro took a 32-30 lead. From there, the Warriors never looked back, winning their seventh game of the year and remaining undefeated with a 70-57 win over the Tigers. “That was huge, because you love to go in the locker room even with a little bit of a lead, because it just gives a different atmosphere in the locker room and just gives them a little confidence, because it was neck and neck going into that point,” Foxboro coach Lisa Downs said about the team’s run at the end of the half. Lizzy Davis (14 points), who spent much of the first half on the bench after two fouls in the first 1:15 of the game, started the third quarter by hitting a three-pointer and then hit back-to-back jump shots to give Foxboro a 39-30 lead. Following a made free throw by OA’s Alex Sheldon (five points), Mollica completed a three-point play to give Foxboro their largest lead of the night up to that point at eleven (42-31). A 6-0 run by the Tigers cut the lead to 42-37, but two free throws by Shakirah Ketant (seven points) and a three-pointer by Chelsea Gibbons (16 points) off a feed from Davis put Foxboro back up by ten at 47-37. “At halftime, we discussed the importance of the third quarter and to come out with a lot of intensity and a lot of poise,” Downs said. Foxboro led 50-39 with under a minute to play in the third quarter, but back-to-back scores by OA freshman Caroline Peper (17 points off the bench) and Tate Hadges (eight points, four rebounds) cut the Warriors lead to 50-43. Again though, the Warriors scored late in the quarter to shift momentum, as Mollica’s layup with three seconds left in the third quarter gave Foxboro a 52-43 lead heading into the fourth. In the fourth quarter, Foxboro never surrendered the lead, as the closest OA got was within eight, after two made free throws by Peper with just over three minutes to go in the quarter made the score 58-50. Another 7-0 run by the Warriors would push their lead to 15 with just over two minutes to go in the half and essentially seal the win for Foxboro. “The girls that really showed they wanted the ball did some really strong things like Chelsea Gibbons, as I said Lizzy Davis, but I thought Shakirah Ketant came in and did some really great things inside the paint, which we didn’t really have a great inside presence in the first half, so I think adding that was really creating a little bit of a defensive disturbance for Oliver Ames, as they had to focus their attention inside as well as wherever Katelyn Mollica was,” Downs added about the Warriors’ second half performance. Foxboro (7-0) will travel to Attleboro on Friday to take on the 3-5 Bombardiers. Oliver Ames (5-2) will look to get back in the win column at Mansfield on Friday night.